James V lived from 10 April 1512 to 14 December 1542 and was King of Scotland from 9 September 1513 until 14 December 1542. He was born at Linlithgow Palace and became an infant King when his father James IV was killed at the Battle of Flodden on 9 September 1513. 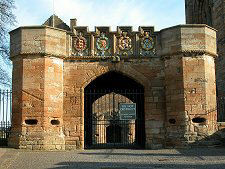 He was crowned in the Chapel Royal at Stirling Castle on 21 September 1513. The wider picture in Scotland at the time is set out in our Historical Timeline. The ill-advised and wholly unnecessary Battle of Flodden killed not only the King, but alongside him a significant part of the Scottish nobility (see our Historical Timeline). What was left of the Scottish establishment only very warily accepted Margaret Tudor, sister of Henry VIII, as Regent for the young James. And when she married Archibald Douglas, 6th Earl of Angus, in 1514, Margaret, was replaced as Regent by the young James' uncle, the Duke of Albany. The Duke of Albany effectively ruled Scotland in James' name with support from French troops for ten years until May 1524 when he departed for France, and Margaret Tudor again stepped in. Two years later, in April 1526, James assumed personal power at the age of 14. By this time Margaret was estranged from the Earl of Angus, and he kidnapped James V and kept him captive for three years in an effort to gain his confidence: and to exert influence over Scotland and appoint his relatives to positions of power. James V escaped in 1528, and began his personal rule of Scotland by driving his hated stepfather the Earl of Angus out of Scotland, outlawing the whole Douglas family, and seizing their lands. His use as a political ping-pong ball as a child showed through in a suspicion of his nobles that he retained throughout his life. Though he sought to balance this with an understanding of the real needs and concerns of his subjects which was unusual in a monarch of his day (or any other). He used to travel anonymously around Scotland in the guise of the Gudeman o'Ballengeich. He also had a number of mistresses, including Euphemia Elphinstone, by whom he fathered the illegitimate Robert Stewart, 1st Earl of Orkney. Misrule and corruption during James' minority meant he inherited a kingdom that was virtually bankrupt, so he set out to find a bride with a large dowry. On 1 January 1537 James V married Princess Madeleine of France when he was 24 years old. Though she was already in ill health with tuberculosis, this was a match that not only brought wealth but would would also strengthen the Auld Alliance against England. By this time James was already father to at least nine illegitimate children by a number of mistresses. 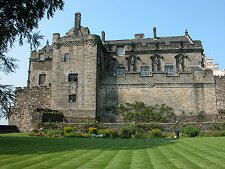 James and Madelaine returned to Scotland in May 1537, but Madeleine's health worsened and she died in James' arms in July 1537 at Holyrood Palace. In June 1538 James married again (and received another dowry), this time to Marie de Guise, the adopted sister of Madeleine. Marie was a widow, and already a mother of two sons. James and Marie subsequently had two sons of their own, but both were to die in infancy within hours of each other in 1541. Like his father before him, James V fell out with Henry VIII of England, this time over Henry's insistence that the Scots should follow the English lead in breaking with the Roman Catholic Church. James had already pledged his support to the Pope and the Catholic faith in return for a significant slice of ecclesiastical revenues in Scotland, so could not afford to comply with Henry's demands. In 1542, James, by now in ill health himself, declined an invitation to meet Henry VIII at York. Henry responded by invading Scotland. James sent his army south to stem the English invasion, but the Scots were defeated at the Battle of Solway Moss, near Carlisle, on 24 November 1542. 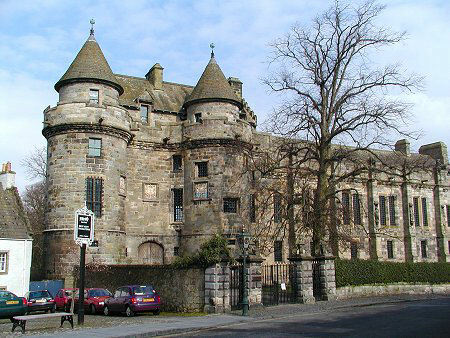 James, by now aged just 30, was ill in bed at Falkland Palace in Fife. On 8 December 1542, Marie de Guise gave birth to a daughter, who was to become Mary Queen of Scots. When news reached James V that the son he wanted had not arrived, he is quoted as saying: "It cam wi' a lass and it will gang wi' a lass" remembering how the dynasty had started with Marjorie Bruce and fearing it would now end. Six days later, on 14 December 1542, James died, probably from cholera. 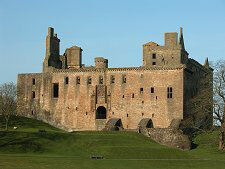 He was succeeded by the infant Mary Queen of Scots.